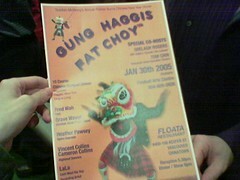 Check out Bill Stilwell's Gung Haggis Fat Choy 2005 Photos. By the way, it was fun meeting Aaron (whose photos are not yet up) and chatting with Bill at the bloggers table yesterday. See you next year! This entry was posted in 2005 Gung Haggis Fat Choy dinner on January 31, 2005 by Roland Tanglao. Check out Andy Smith's pictures of Gung Haggis Fat Choy 2005 on Flickr. Check out Boris' Gung Haggis Fat Choy 2005 Photos on Flickr (all 80 of them!). Wow… what an evening…58 tables and approximately 570 people attending the 2005 Gung Haggis Fat Choy™ dinner. audience. Definitely an intimate dinner for almost 600 people! doh drum and celtic bodran drum. Very cool! “Oops,” says Shelagh… as both our parents were in the audience. “Only in Vancouver, would this happen,” he declared. the real power is in the electorate, and the community activists. community, and recognizing the community that we have. the audience all punching air – an amazing sight. Have a good night's sleep!!! This entry was posted in 2005 Gung Haggis Fat Choy dinner, Asian Canadian Cultural Events, Main Page, Recent Reviews, Scottish, Gaelic, Irish Celtic events and stories on January 31, 2005 by Todd. than ever. What's next? I say go national! More later. Here's my GungHaggisFatChoy 2005 photos on Flickr. Check out Flickr's GungHaggisFatChoy tag (and GungHaggisFatChoy 2005 RSS feed) for more photos. This entry was posted in 2005 Gung Haggis Fat Choy dinner, Main Page on January 31, 2005 by Roland Tanglao. Rev. Chan Yu Tan family reunion. Things to Remember for January 30 Gung Haggis Fat Choy� dinner! Things to remember for Gung Haggis Fat Choy™ dinner on January 30. Free Parking at Floata! Tell the parkade attendant you are attending the Gung Haggis Fat Choy™ dinner at Floata. Gardens, and designed the new Hall. table or the organization name. Dinner show starts promptly at 6pm. organization. Spread the word! or join the Gung Haggis Fat Choy dragon boat team our other fundraiser recipient. Have fun, and Sing lots! restaurant management or our production coordinator Vicky Tanguay. 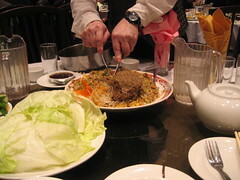 This entry was posted in 2005 Gung Haggis Fat Choy dinner, Main Page on January 29, 2005 by Todd. where anything can happen. I am looking forward to it. jazz bands and organizes First Friday Forum, a musical and discussive forum for traditional and world music at the Nikkei Centre – first friday of each month.